The Honor View 10 and Samsung Galaxy S9 are both finally available in the US. These two flagships are very different in terms of design, software and price. In this article, we do a full comparison of them. Which should you choose? It goes beyond subjective taste. The Samsung Galaxy S9 goes farther in terms of design, with its modern curves on the front and back, glass body and Infinity display. Of course it isn't so new compared to the previous generation, but the Galaxy S8 was a huge step forward nevertheless. The S9 is a carefully crafted device, with every detail just right, from its seamless construction to the more discreet CE logos on the back. The Honor View 10 is nice to hold and pleasant to look at, but after a few months of use, its personality will fade into the background, especially compared to a bold phone like the S9 which stands out. The aluminum makes it more drop resistant, but the protruding camera is really unfortunate. Holding both side-by-side, you really feel the difference between the two devices. Both phones come with a headphone jack, but the fingerprint sensor is located on the front of the View 10 and on the back of the S9. Don't worry, Samsung has made the fingerprint scanner easier to reach this time. With the View 10, Honor has put a focus on AI. At the beginning of January, the Chinese company released a smartphone with the Kirin 970 processor, which is equipped with an artificial intelligence unit capable of, for example, understanding which settings or filters are needed before snapping a photo. And this is just one of the ways AI can make your smartphone more powerful. Because Huawei integrated the AI chip in the Mate 10 Pro already, Honor was able to do it more easily. As in the example above, the main benefits of AI will be felt when using the camera of the View 10, and it must be said that AI and marketing go hand-in-hand. In any case, the technology is in its early stages and forward-looking Honor managed to bring it to a smartphone that costs around $600. Though Bixby is touted as one of the main selling points of the Galaxy S9 and the S8 before it, for me, it continues to be a disappointment. Despite Samsung's attempts to optimize it and give it a dedicated hardware button, I still think that Bixby is useless at its current maturity level. Competition between voice assistants is fierce, and compared to Google Assistant, it doesn't make the grade. Considering its limitations, Bixby isn't worthy of its own hardware key. Bixby Vision on the S9 might bring a bit more satisfaction since it is now able to recognize written phone numbers and add them directly to the keypad. The View 10 gets a dual camera, while the Galaxy S9 only gets a single sensor. Nevertheless, the S9 is one of the first smartphones to offer a variable aperture that changes from f / 2.4 for bright environments to f / 1.5 for dark environments. Thus it improves shots in low light conditions, even if they are still far from perfect. Thanks to the Multi Frame Reduction, night shots have significantly reduced noise. In good light, the S9 takes excellent, detailed shots, which are even better if you admire them on the AMOLED display of the device. When exported to the PC, there is too much saturation, though. The S9 can also record in Slow Motion in HD at 960 frames per second. The S9 remains one of the best cameras on the market, but not the best. In any case, it succeeds in surpassing that of View 10. Samsung Galaxy S9 camera review: up to expectations? The Honor View 10 packs a double camera with a 16 MP RGB sensor and a 20 MP monochrome sensor with f / 1.8 aperture. It takes excellent black and white shots, and the results are always good when there is sufficient lighting. In the evening though, the shots suffer from noise and blur when not using a tripod. The absence of stabilization makes itself known in photos and videos. If you don't have special requirements, the View 10 is still a good choice. With the artist mode, you can have fun applying comic-style filters to your photos. The View 10 also has augmented reality capabilities. In addition, you can manually adjust the camera settings and save your photos in RAW format. What is the difference in benchmarks and daily use? The Samsung Galaxy S9 is one of the most powerful smartphones we've ever tested. In our review, we used the European version with the Exynos 9810 processor, together with the Mali-G72 MP18 GPU and Samsung Experience 9.0, which resulted in a fluid system capable of handling any type of task. There are no compromises with the S9, despite the small drops in fluidity, imperceptible in everyday use, which we found during our tests. The Galaxy S9 is the most powerful smartphone on the market. Everything flows smoothly with the View 10 as well. The octacore Kirin 970 with its Neural Processing Unit and Mali-G72 MP12 GPU run smoothly together. The display of the S9 does more justice to games and videos (as well as stereo audio), without a doubt. The View 10 runs just as it should, with no overheating or anomalies, but it just can't keep up with the S9 in the benchmark tests. Speaking of performance, I can't forget to mention the battery. The View 10 has a non-removable, 3,750 mAh battery with SuperCharge, which allows it to reach up to 50 percent in 30 minutes. The battery life it offers is solid: you'll manage to reach the end of the day with 20 percent left if you use the phone intensively, but you'll get a day and a half with moderate use. On the PC Mark test, the View 10 lasted 7 hours and 28 minutes, while the S9 lasted 7 hours and 15 minutes. The battery life is certainly not the strong point of the Galaxy S9, as we saw in our full review of the battery, but you can see that in the benchmarks above, it got more or less the same result as the View 10. In daily use, it will get you through the day, in optimized mode. If you use the display at its maximum resolution, the battery life drops drastically. As you can tell, these are two very different devices. The Galaxy S9 boasts a premium look, a better display and a better photography experience in low light conditions. It handles multitasking and games with ease, and the display does justice to any multimedia content, including AR and VR. Otherwise, the View 10 has nothing to envy about the S9. It runs smoothly and does what it sets out to do. It doesn't excel as well as the S9 in some categories though. However, the View 10 is costs considerably less and has more memory. Both run Android 8.0 Oreo, but it's your choice between the two different interfaces. 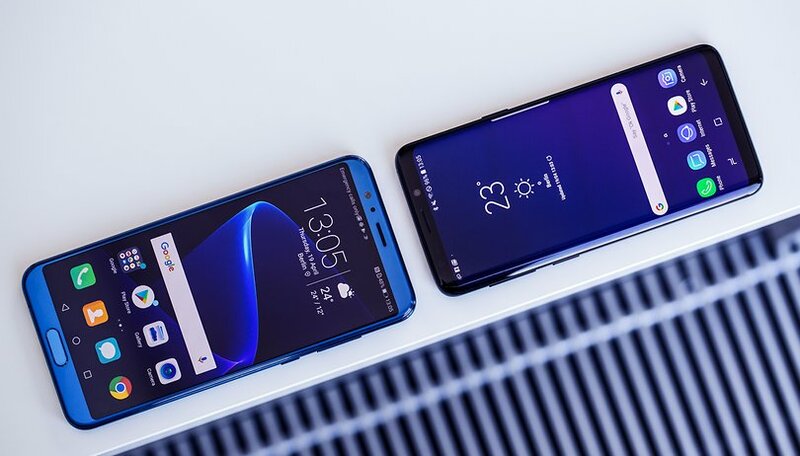 Choosing between the two might seem daunting, but it's actually simple: for those two want flagship performance, the latest version of Android and of-the-range specs, you'll do just fine with the View 10 for about $500. For those who don't mind spending more, love having the latest releases, a top camera, or just dig the Samsung brand, you can't go wrong with the Galaxy S9. Choose “Galaxy S9” or “Honor View 10”. Just the comparison I wanted. If priced right, the view 10 is a winner although the kirin cpu & poor gpu can affect the heavy gaming. Wow, View 10 is using some really crappy RAM. Thanks William! We've just fixed it. I don't think the honor view 10 should be overlooked. You can't beat the 500.00 price tag. Accessibility & what will work and what won't on GSM carrier's. No Sprint or Verizon!